So, wow, the Bertolli Giveaway got 319 entries, which is the most comments I’ve received on a blog entry EVER. That includes the posts I wrote about quitting my job and my two book announcements. I guess the moral of this story is that the next time I have any big news to share, I should also give away an ice cream maker. Seriously though, I must have spent an hour or two (grand total) approving all the first-time commenters that entered. I am grateful for all my readers and I thank you for visiting the site, but that didn’t stop me from crawling out of bed at 12:30am last night to turn off comments on the post after the entry deadline because I didn’t want to find 30 more emails in my inbox the next morning. Congratulations to Amy from Michigan who was the randomly drawn winner this morning! She has already accepted her prize. And thanks to Bertolli too! I am almost frightened to eat them because I am 95% sure they must have been irradiated to reach such an awesome size. I’ve noticed for the last month or so the strawberries for sale here in MI have been enourmous and also really cheap. They’ve been so scary big that they scared me into paying more for the orgranic ones, that while costing slightly more are so much tastier. I am really happy with the strawberries this season so far. They’ve been sweet and juicy! Hahah, I put up a picture on my FB yesterday of one of the giant mutant strawberries! I had some mutant strawberries of my own the other day. They were so pretty I just had to buy them but then they tasted like rubber. No flavor. I picked strawberries last year – a couple of different kinds. They big mutant ones were nice. . . until I got to the wee little ugly ones. The big ones, I shared with my kid. The little ones? They got stashed in the freezer all-for-me. You are a lucky woman for getting to move to NC! I grew up in that area and now live in Louisville. And while this is a very cool town, I miss the weather of the carolina’s so much! I hope you are happy there. And we always pronounce it RALL-ee. On the west coast of BC, that is the normal size of strawberries at the peak of the season. They are the tastiest. I am lucky to live in CA where the strawberry stands are numerous and the berries taste/look delicious! 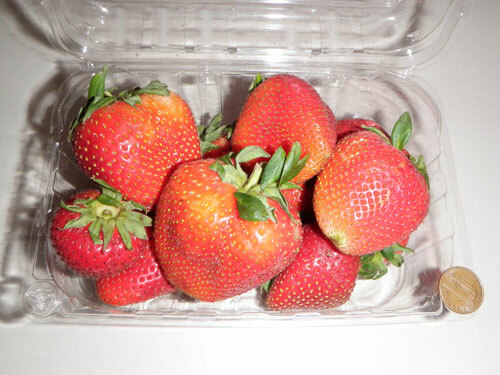 Your mutant strawberries did look a little scary. Thanks for the chance at the giveaway. Funny, I often comment but your giveaway happened to be one I missed. I didn’t see the email until Tuesday. Although, I recenly changed my “name” on your blog so it probably looks like I haven’t commented too often. hmm.. correct me if I am wrong here, but I thought you “irradiated” after the food was done growing. @Barb – Does BC have an east coast? I never buy strawberries that big. Very suspicious. I live in Great Britain and all though we don’t have the best fruits in the world growing here, are strawberries are fantastic. In fact I would say may be the best in the world. Has anyone eaten our strawberries? Mutant Ninja Strawberries! Where I used to work, chocolate-dipped strawberries even larger than that were always featured at receptions and fancy parties. We used to joke that you could give someone a black eye by swinging one of those strawberries by its stem.